I'm about to write a dangerous sentence, but here goes. After the tasty success of my first umeshu and yuzushu batches, I have decided to experiment a bit. 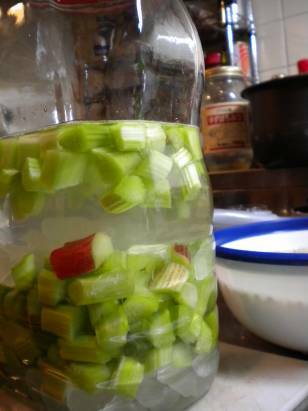 I've just put up my first batch of rhubarb shu. Rhubarb sauce, butter, and jam are all very nice, but living in Japan called for a new twist on an old favorite. So, just before last week's rains arrived in full force I pulled a few stems. Soon cut into chunks and paired with the usual accomplices - rock sugar and shochu - the work is underway. As far as I know, it's never been done before (in Japan), and the batch is smaller than usual. (I didn't want to give a whole kilogram of rhubarb to something that, frankly, might taste horrible.) Taste-testing should begin within a week to see how it's progressing. Our concern, of course, is the sugar to alcohol ratio. Syrupy sweet isn't appealing, but shochu with just an essence of rhubarb isn't, either. Fingers crossed we get something worth tipping a glass to come November. Meanwhile, without more ado, here's the recipe brewing in our laundry area. *My cups, for what it's worth, were a bit heaping. I tend to do that when I'm dealing with large chunks of things as I always imagine the way they jumble together means it's not really filling the space effectively. This could be an error in judgement. **As I mentioned above, I'll be trying to test it regularly to see how the flavor goes. It's pretty unusual here, too. 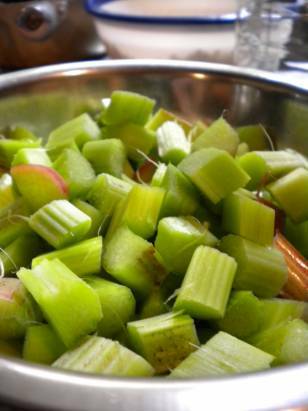 Almost no one grows rhubarb (except for a few further north) and folks only think about using it in jam. The foreign community here in Tokyo would raid my garden in a heart-beat if they knew I had two thriving plants. Great blog! Found you through your post on Jerusalem artichokes- or yacon? Which was it? If you are up for a trade then leave a post here and we can work out some way to make it happen. Hi Jeff, Thanks for reading! Glad you found some things you liked here. I would be happy to share some rhubarb with you, although I suspect Kyushu may be a bit too hot for rhubarb to settle in happily. I'd be willing to help you give it a go, though. Depending where you are, you'll want to at least give it a somewhat cool, semi-shaded place. Even here in Kanagawa it is finding the garden too hot. I'll be splitting a crown in March, 2015. I left a plant at the farm in Tokyo, and I'll need to retrieve it then. I can send it along then. If you give me your email (I won't publish it here, of course.) I'll send you a note and we can start sorting out the details. Thanks!